Aldwych Theatre, London. Thursday 31-January-2019. Supper beforehand at Roka, Aldwych. The food was excellent and they do a deal - 2 courses and a glass of bubbles for £26 per person. Also conveniently very close to the theatre. The show was a straightforward, linear biography stuffed full of the greatest hits. The lead singer was the outrageously talented and gorgeous Adrienne Warren. Michael Billington at The Guardian writes: Phyllida Lloyd’s musical is a heady celebration of triumph over adversity, with an astonishing turn by Adrienne Warren. A special mention should also go to the very talented girl who plays the young Tina and sings several songs with great power. Being married to a Scot I have of course had haggis, neeps and tatties many times. I’ve even been to a number of Burns suppers in London where they have a piper and a reading of the “address to a haggis”. But I’ve never been to a full-blown Scottish Burns celebration. We were going up to Scotland to visit Mary‘s mum over the weekend of the 25th of January. 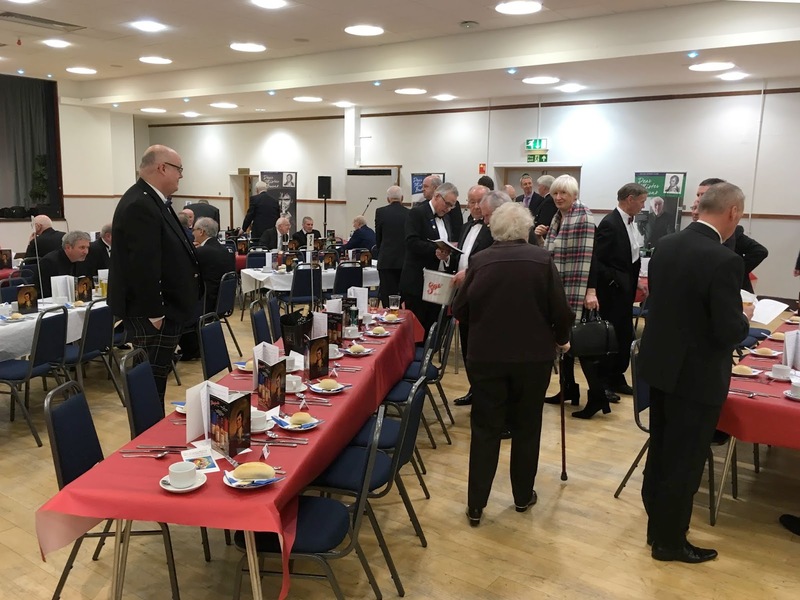 So Mary tracked down a Burns supper which turned out to be the Irving Burns Club 193rd Burns celebration. That’s an impressive piece of continuity and history. To start – everyone gathers, the host says a few words, everyone sits and the Selkirk Grace is said. The meal – the starter is served, the haggis is piped in, the host performs Address to a Haggis, everyone toasts the haggis and the main meal is served, followed by dessert. After the meal – the first Burns recital is performed, the Immortal Memory (the main tribute speech to Burns) is given, the second Burns recital is performed, then there’s a Toast to the Lassies, followed by a Reply to the Toast to the Lassies, before the final Burns recital is performed. To end the night – the host gives a vote of thanks, everyone stands and sings Auld Lang Syne, crossing their arms and joining hands at the line ‘And there's a hand, my trusty fere!’. A more extensive and somewhat droll description is available on the BBC website. When we arrived all the great and the good of Irvine were there, the movers and shakers, the Provost (Mayor) and local dignitaries. Before supper we had readings of Rabbie‘s poems by various local school children. It might as well have been in Klingon or Serbo-Croat for all that I could make sense of it. It was definitely a foreign language as far as I’m concerned. The meal was much as expected: soup, haggis neeps and tatties, roast beef and pudding. Afterwards we started with “the immortal memory” and various toasts, "please be upstanding..." for this and that. Poor old Mary‘s mum was up and down like a yo-yo. We tried to persuade her to sit them out but as we were right in front of the top table so it would’ve been a bit obvious. Apparently the next day her knees were aching. Much to my disappointment we didn’t get the usual address to the lasses and the lasses response. Apparently they are traditionally humorous much along the lines of a best man speech. Instead we got various orations and then some Scottish folk music. And I learnt a new (old) meaning of the word Croupier: 2. HISTORICAL the assistant chairman at a public dinner, seated at the lower end of the table. We mostly drank red wine but I had to have one nip of whisky which is, I understand, traditional. The Provost came round with a large bottle of whisky and insisted on pouring me a hefty top up. It would’ve been churlish to refuse. Butlins, Skegness. Friday 18-January-2019 to Sunday 20-January-2019. There are loads of excellent photos on the FaceBook group Butlins Rock & Blues Festivals Skegness. I give you my crappy iPhone photos because they are my memory joggers. 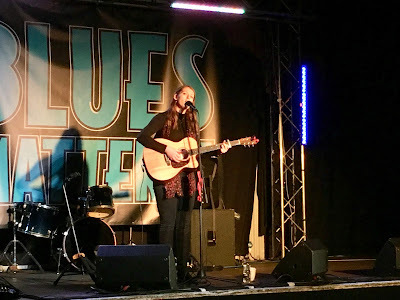 There is a good review over at Get Ready To Rock: GREAT BRITISH ROCK & BLUES FESTIVAL – Butlins, Skegness, 18 – 20 January 2019 with more pictures and a different list of bands. Inevitable given the wide ranges of choices over four stage. Sure enough the weather lived up to Skeggie's reputation with temperatures only just above zero. Last year, when we booked, we asked for accommodation closer to the venues. I swear they put us in a block further away. It matters when you are a hot house flower like me and the wind-chilled walk to and from the music chills you to the marrow. Off to the music. Jack Broadbent was excellent. The "Introducing Stage" showcases up-and-coming acts who you can vote for and the winners get a main stage slot at next year's festival. After a couple of bands at lunchtime, the evening started with some Introducing stage sets, then an early supper and off the Reds stage for The Della Grants. I popped over to Centre stage for a couple of songs from Clearwater Creedance (sic) Revival. Tribute band and excellent covers of CCR finishing up with a rousing version of Proud Mary. Back at Reds for Martin Barre's Jethro Tull. He played guitar with Jethro Tull from their second album in 1969 to the band's initial dissolution in 2012. [Wikipedia]. Martin raised the question, "When is a band not a tribute band?" With personnel changes over the years he is the only original member left. But at least there was one so he opined that it was OK. Using that criteria Dr Feelgood are a cover band not the original. Dave Speight. Now this is full-on Delta Blues, rocking chair on the porch, woke up this morning, kind of blues. He's been playing his own, self taught versions of the classics for 50 years. My sort of blues. Mike Vernon and the Mighty Combo. Record producer turned performer. The list of acts he has produced is impressive. Now he has stepped out from behind the console to entertain us and his experience shows. The day started in a chilly Jaks stage. Sadly the worst stage of the lot for a favourite artist of ours, Lucy Zirins. The acoustics are poor and the layout is not conducive to a cosy, intimate atmosphere. Still Lucy was the real trooper and delivered a good full hour's set. Lucy had pre-release copies of her latest album "Unfound" so we bought two, one for us and one for our friend Delton. Lucy patiently recorded a little message for Delton and I posted off his CD as a surprise gift. Due to a terrible timetabling clash Lucy was on at exactly time as Martin Harley who we had seen at Ronnie Scott's supporting Lucky Peterson. We were pleased to see that he was on the line-up here so Mary went to see Martin and I went to see Lucy. General view of the Reds stage which paradoxically was hosting the Blues acts. Storm Warning. The day continues. Mary got an email from The Half Moon mailing list announcing that Peter Donegan (son of Lonnie Donegan), booked to play the following weekend, was about to appear on The Voice. So we watched The Voice and decided to pop along. Despite national TV exposure, there were still tickets available for the princely sum of £12 (or £14 on the door). A meal beforehand in the pub then into the room for the support act who was actually one of the band. Unfortunately I didn't make a note of his name but he did a good set. Then the man of the hour. He did remark that a few days before he had played to six (6!) people at a gig in Scotland. I am glad to say this was a lot better attended. At the end I went to buy the latest CD. When I like the music I always like to do that, not just to listen to the music but to support the musician; they get the money direct into their pocket with no middlemen nor distributors. His friend / manager / business partner insisted on borrowing my phone to take some pictures and who am I to disagree. Nice man, good music, excellent evening. Various locations. Monday 31-December-2018 / Monday 07-January-2019. Several things came together to create a second holiday road trip. We had already planned NYE in the New Forest with Bob and Lynn. Then we got tickets to see Mary Coughlan just outside Dublin on 4th Jan. So rather than return to London and fly from a London airport we imposed upon our hosts, stayed on an extra day and flew out from their local airport, Southampton. When Tim and Sarah heard that we were flying back into Southampton they insisted we visit them on the Isle of Wight since Southampton is practically on their doorstep, so that is what we did. New Year's Eve involved the usual eating and drinking and a walk in the New Forest on New Year's Day to walk off the hangover. Except there wasn't really a hangover due to the quality of the wine and the leisurely pacing of the meal. But no reason needed to stroll around such a lovely part of the UK. As usual the New Forest ponies are wandering about ignoring the humans as they are well used to our presence. Another night at Bob and Lynne's then it was a short drive to Southampton Airport to park up the car whilst were were were in Dublin. Southampton is a small regional airport and as such a pleasant change from Gatwick and Heathrow. Dublin has a number of statues most of which have nicknames. This is Oscar Wilde known as "The Fag on the Crag"
Phil Lynott is a new addition to the pantheon of statues. Not sure what his soubriquet is yet but I am sure the Dubliners will provide. We went out for lunch with a friend who lives in Dalkey just outside Dublin. We know Dublin well so mostly guided ourselves around but Mary spotted a guided tour that was history and pints. Instead of the usual, somewhat tiring, three hour walk we got two hours walking with a history lesson told through the personalities that shaped it and the places where major events took place followed by an hour sitting in a pub, drinking and learning about Guinness and the Irish beer industry. Definitely Five Stars for Nils, the guide. The Mary Coughlan gig was excellent and gets its own post. The flight back to the UK was so uneventful that we did not need the contingency we had built in to catch the car ferry to the Isle of Wight. We had 45 minutes from when we cleared immigration so called the ferry company, switched to the earlier ferry and scooted down to the port with 5 minutes to spare. According our friends they are fairly relaxed about latecomers, not like RyanAir - none of this "Boarding closes 20 minutes before departure" rubbish. Less hanging around, more time with our friends. Result! Supper at The Taverners, just one minute's walk away! Rather like the New Forest, this visit was a mixture of eating, drinking and walking, this time with added dog. A relatively short walk along the cliff tops as our hosts' Labrador has dodgy knees and it would be unkind to make him walk too far. A pub lunch at The Buddle Inn and then a short walk back home. More relaxing, eating and drinking. A quick bit of shopping to buy black garlic; there is a lot of garlic grown on the IOW. Then an uneventful ferry back to "The North Island" and home via Mum's house in Fanham to check all is OK, no burst pipes nor post to pick up. Dun Loaghaire, County Dublin, Republic of Ireland. Friday 04-January-2019. Mary Coughlan is one of our favourite artists; we have seen her three times before. Mary spotted that she was appearing at the Pavilion Theatre, County Dublin. We thought it might be a feeble excuse to visit one of our favourite cities so we snapped up a couple of tickets. What we didn’t realise is that the Pavilion Theatre isn’t actually in Dublin, it's in the suburb of Dún Laoghaire. Fortunately it’s only half an hour on the DART from central Dublin where we had booked ourselves an Airbnb. On the recommendation of our friend Danielle we dined before the show at Hartley's. Conveniently right next to the DART station it was easy to find and the food was excellent. Then a short stroll diagonally across the road junction to the Pavilion Theatre ready for the show. It is not a large venue (max capacity 324) and we had seats in the very front row, in the middle. There was a support band, who were fine, and Mary joined them for one number. Then a short break and Mary herself came on. It’s slightly unsettling when you’re that close, like 6 foot away (! ), because not only can you see the performer they can see you. At one point while singing “I Want To Be Seduced” when she got the line “Right from the minute that we’d been introduced” she gave me a cheeky little wave. It’s a good job it was dark, I might have blushed otherwise. Another fantastic concert. I would very happily go and see that woman again.